Essential oils have been used for skin care since ancient times. There are many oils that are good for the skin but one I want to mention in particular is geranium. Geranium is a wonderful oil and is useful for all skin types. This is effective for your whole body. If your facial skin is sensitive don’t scrub as hard as you would your feet. Use a plastic container to mix – glass may break in the bathroom. For storage, use glass. Do this in the bathroom. Use small amounts at a time and massage gently on the skin. You can leave it on for a minute or two for a tightening effect. Rinse. For oily skin, rosemary and cedarwood can be used. Pour the hot water in ceramic bowl. Add the essential oils. Drape the towel over the head, bending over the bowl at least 8 inches above the water, to form a tent. Keep eyes closed during the steam treatment, for 15-20 minutes or until water has cooled. Gently pat face with a towel to dry. Essential oils can be helpful in maintaining beautiful skin. Frankincense, sandalwood, geranium or rose oils are excellent oils to use for this purpose. Put them in carrier oils or in fragrance-free lotions to rub on the face. Blend in 1 oz of Rose Hip Oil and apply as needed. Works well in a roller top applicator. Mix the clay and water to form a smooth consistency. Add the essential oils. Mix well. Apply with fingertips, avoiding the eye area and hairline. Leave on 10-15 minutes but do not allow to completely dry and crack. Remove the mask with a warm wet wash cloth. Rosemary, geranium, basil, cypress, bergamot, cedarwood, clary sage, eucalyptus, grapefruit, juniper, lavender, lemon, rose, lemongrass, patchouli, sandalwood, melaleuca alternifolia and ylang ylang. Combine yogurt and honey. Squeeze vitamin E capsule’s contents into the mixture and stir well. Add flower and mix into a smooth paste. Add essential oils and mix. Apply with fingertips. Leave on for 15-20 minutes before removing with warm water. Frankincense, sandalwood, myrrh, geranium, jasmine, lavender, patchouli or ylang ylang. 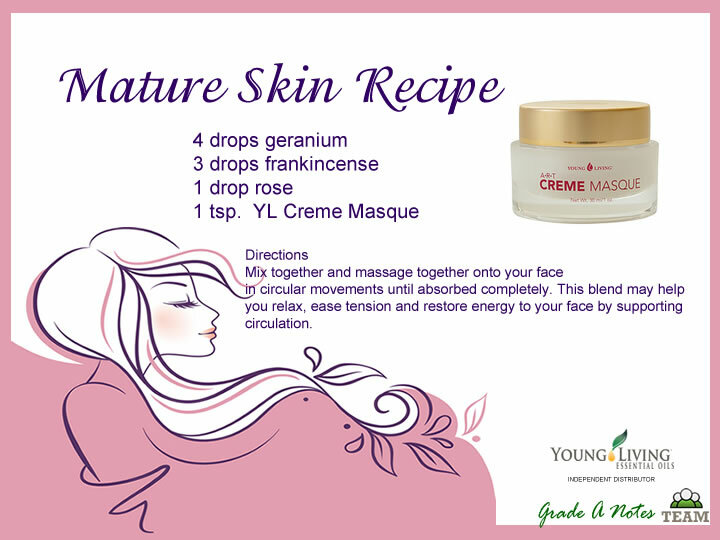 Mix with Satin Body Lotion and apply to skin. Visit the product page for more info on Young Living’s Essential Oils.